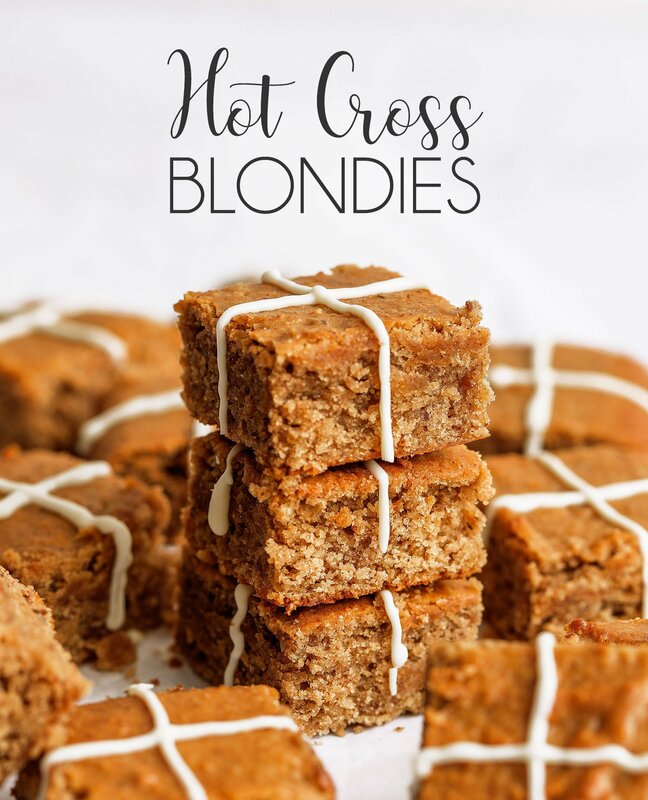 These hot cross blondies are the perfect easy dessert to make this Easter. 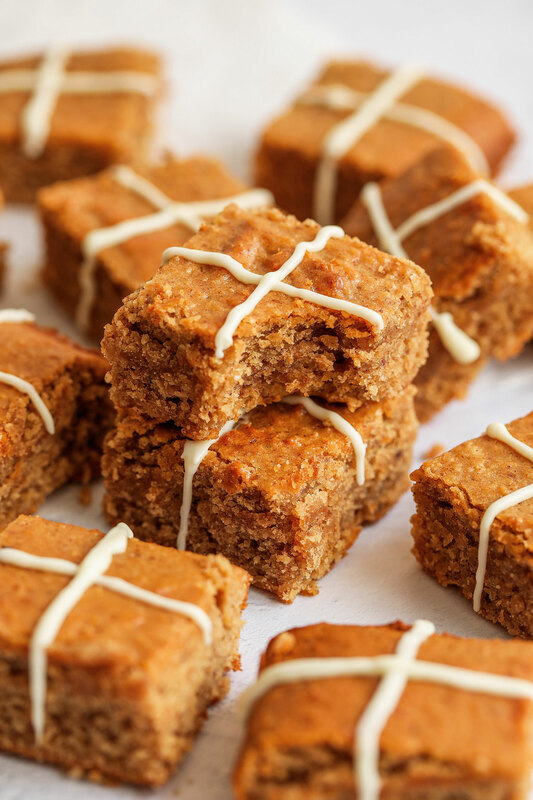 They’re delicious, vegan and gluten-free! 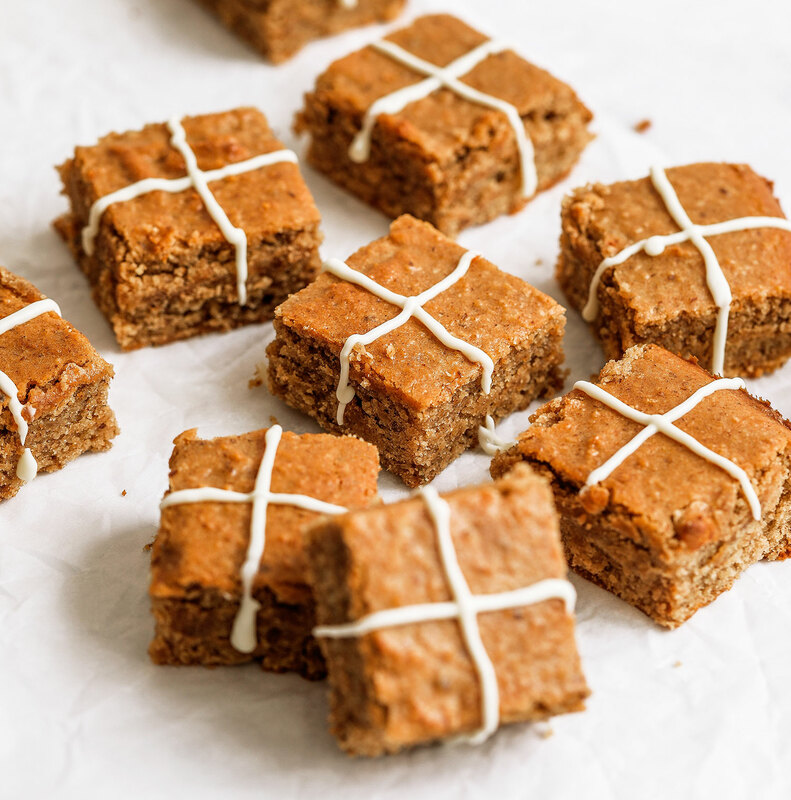 If you’re looking for something to bake that’s a little different this Easter, why not try these gluten-free vegan hot cross blondies? 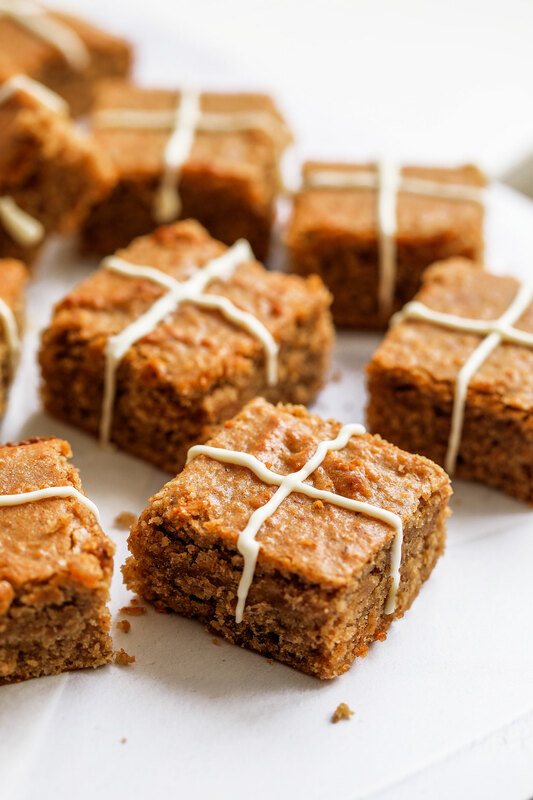 They’re really easy to make and requires very little baking experience. You literally mix everything in a bowl, pour into a pan and bake. That’s it! 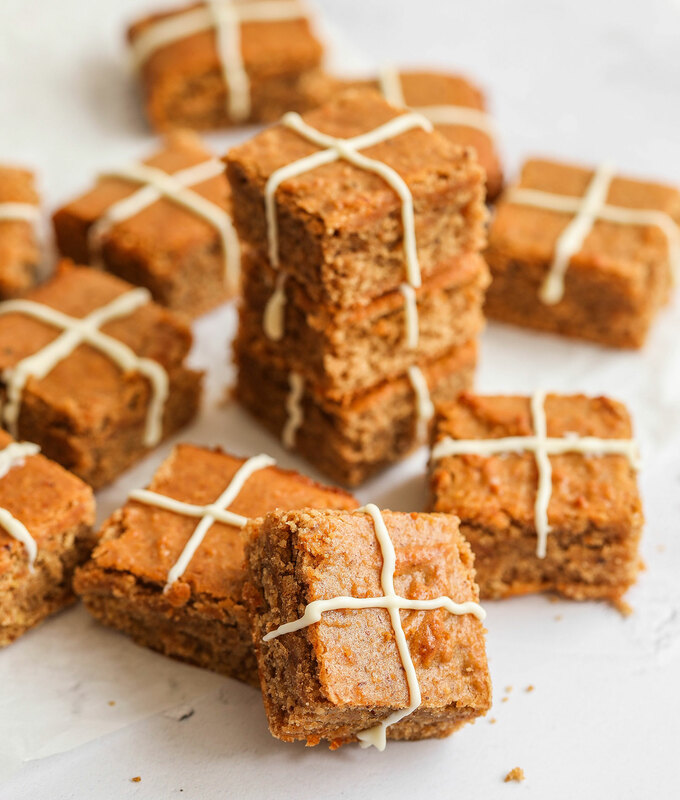 Blondies may not be the first thing that springs to mind when you think of Easter, but I put a fun spin on them to make them more fitting for the season by adding some spices, orange zest and decorating them with crosses using melted chocolate. Hence the name. 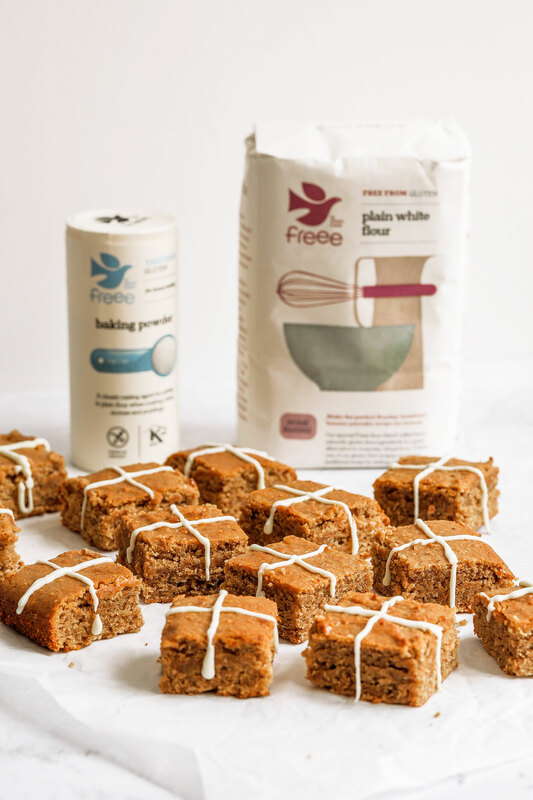 I’m collaborating with FREEE by Doves Farm who have challenged me to create a tasty Easter bake using one of their flours and baking essentials. I’ve been using their gluten-free flours for years especially their plain white flour as it’s so versatile and has never let me down. I’ve used it in all of my recipes that call for gluten-free plain flour. 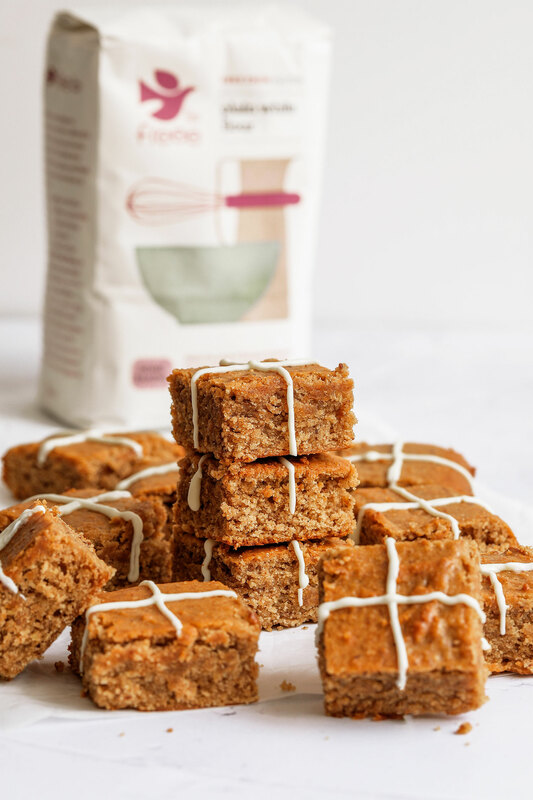 It has never been easier to follow a gluten-free diet and make your own gluten-free bakes at home. 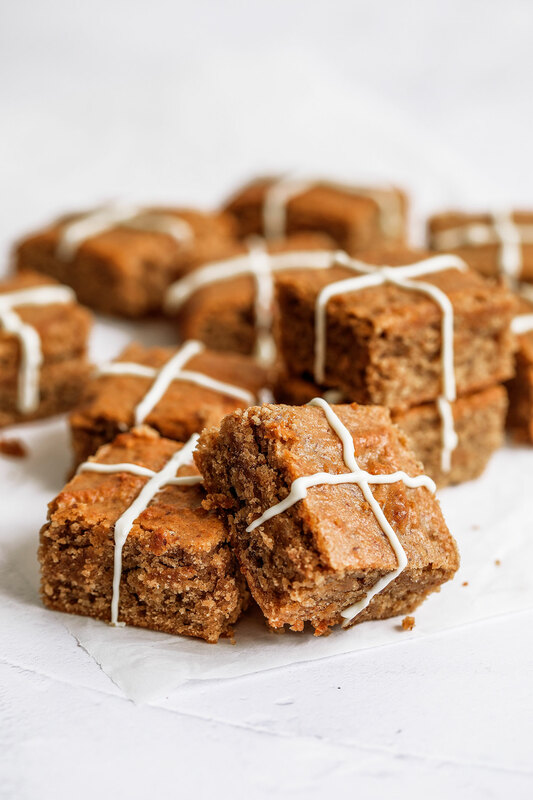 Initially I was thinking of making chocolate hot cross brownies, but then I figured there will be so much chocolate going around and some of us may want a break from overdosing on chocolate, so blondies seemed like the wiser choice. You can make this recipe with or without the white chocolate, or you can even use dark chocolate. Totally up to you! However, I would recommend the more traditional choice of white chocolate. 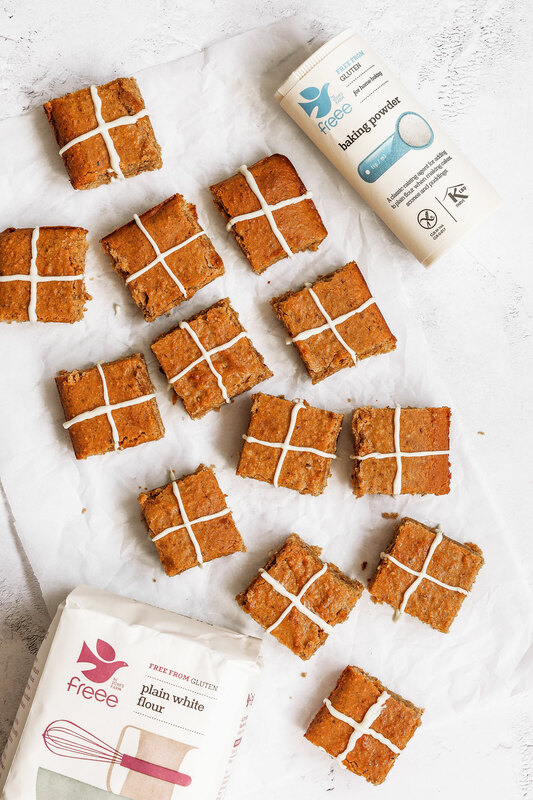 If you are looking to make them vegan but can’t get hold of dairy-free white chocolate (I know it’s not the easiest ingredient to get hold of), you can use dairy-free ‘milk’ chocolate or something like a 70% dark chocolate if you prefer. 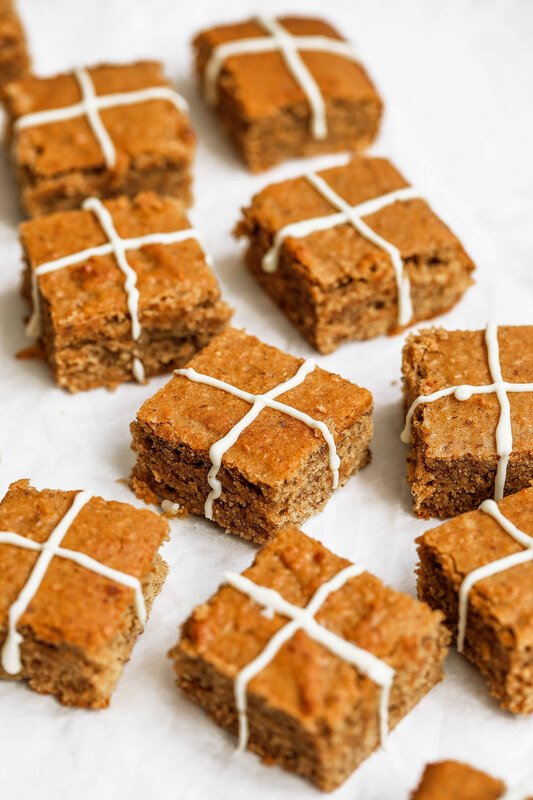 They will still taste and look amazing with a dark chocolate cross. 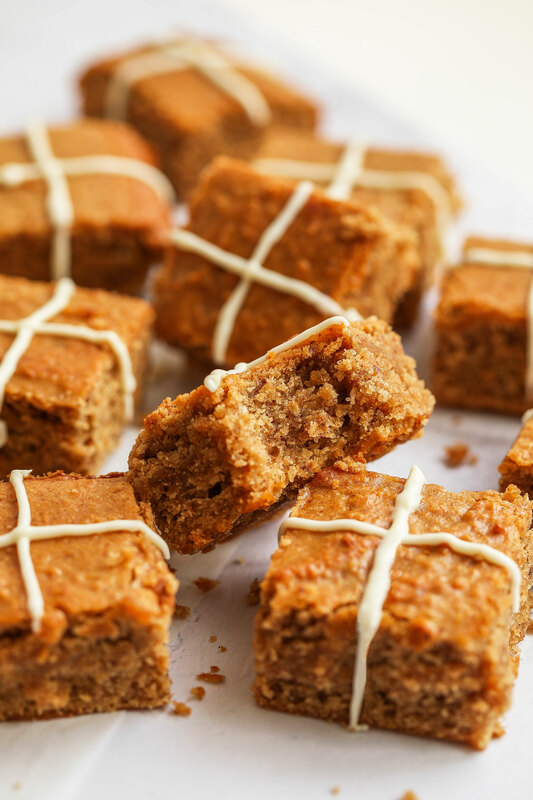 If you’re not vegan, go crazy and add in some mini Easter eggs, leftover uneaten Easter egg pieces or chocolate bunnies! 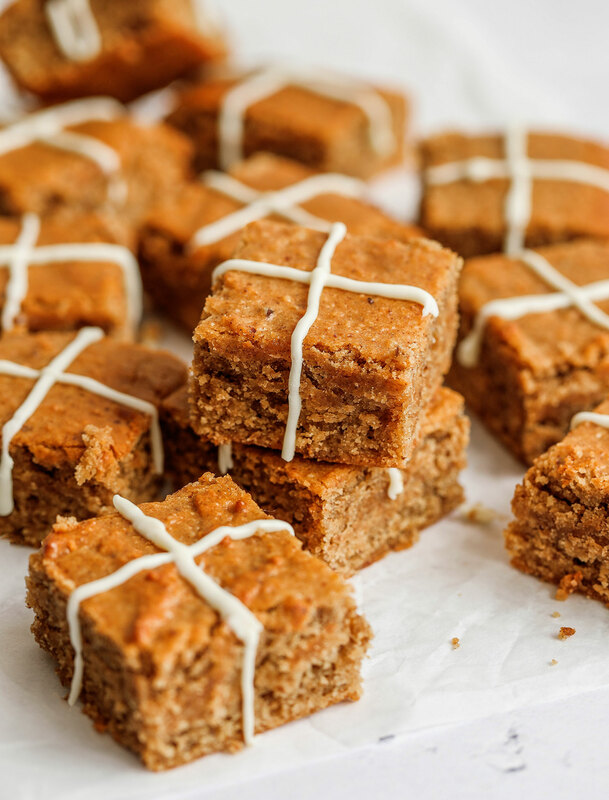 These hot cross blondies would make a great afternoon tea treat for the Easter weekend. If you’re feeling particularly fancy, serve it warm with some vanilla ice cream to make it even more decadent! Start off by creating the flax egg – mix together the milled flaxseed with 3 tbsp of water and leave to set for 10-15 minutes. Sieve the flour, ground almonds, sugar, spices, orange zest, baking powder and salt into a bowl. Mix to combine. Pour into 9×9 square cake tin lined with parchment paper. Bake in a pre-heated 200C/180C fan oven for 20-25 minutes. Allow to cool completely before slicing. Add the white chocolate to a piping bag, then pipe crosses over each blondie and allow to set.